The next IIID presentation will be on Wednesday 13 March at 11am by Dr Baca Chan, Institute for Respiratory Health, the University of Western Australia. Dr Chan’s talk is titled “Modulation of innate immune signalling by murine cytomegalovirus”. The next IIID presentation is on Wednesday 6 March at 11am by Dr Silvana Gaudieri, Institute for Immunology & Infectious Diseases, Murdoch University and the University of Western Australia. Dr Gaudieri’s talk is titled “Understanding host-pathogen co-evolution: from sanger sequencing to single cell genomics”. The next IIID presentation will be held on Wednesday 24 October at 11am by Dr Jori Symons, The Peter Doherty Institute for Infection and Immunity, University of Melbourne. Dr Symon’s talk is titled “Position matters: Determining the HIV integration landscape in individuals on ART”. The next IIID presentation on Wednesday 19 September at 11am will be by Professor Wally Langdon, University of Western Australia. Professor Langdon’s talk is titled “Improving cancer treatment by preventing chemotherapy-induced myelosuppression”. The next IIID presentation will be on Wednesday 12 September at 11am by Dr Joost Lesterhuis, John Stocker Research Fellow at the School of Medicine and Pharmacology Research Staff, University of Western Australia. Dr Lesterhuis’s talk is titled “Unravelling the networks underlying successful immunotherapy responses in cancer”. The next IIID presentation will be on Wednesday 15 August at 11am by Dr Bree Foley, Telethon Kids Institute. Dr Foley's talk is titled "Enhancing NK Cell Immunotherapy. The next IIID presentation on Wednesday 1st August at 11am will be by Dr Livia Carvalho, Lions Eye Institute, University of Western Australia. Dr Carvalho’s talk is titled “Gene therapy for retinal degeneration: current challenges and advances”. The next IIID presentation on Wednesday 11 July at 11am will be by Professor Valérie Verhasselt, Larsson Rosenquist Foundation, Chair in Human Lactology, School of Molecular Sciences, University of Western Australia. Professor Verhasselt’s talk is titled “Breastmilk drives early immune education: The good and the bad for allergy development”. The next IIID presentation is by Dr Archa Fox, Senior lecturer, School of Human Sciences and the School of Molecular Sciences, University of Western Australia, affiliate investigator Harry Perkins Institute of Medical Research. Dr Fox's talk is titled "New insights into subnuclear paraspeckles: where long noncoding RNA meets phase separation". I am delighted to announce the next IIID presentation will be on Wednesday 6 June at 11am by Professor Ruth Ganss, Laboratory Head, Vascular Biology and Stromal Targeting, Perkins Institute of Medical Research, University of Western Australia . Professor Ganss’ talk is titled “Stromal Remodelling and the Immune Response to Cancer”. I am delighted to announce the next IIID presentation will be on Wednesday 16 May at 11am by Professor Bu Yeap, Professor, Medical School, University of Western Australia and Endocrinologist, Department of Endocrinology and Diabetes, Fiona Stanley Hospital. Professor Yeap’s talk is titled “Hormones and health outcomes in men”. I am delighted to announce the next IIID presentation on Wednesday 14 March at 11am will be by Dr Herbert Ludewick, Albany Medical College, New York, USA. Dr Ludewick’s talk is titled “Lethal synergy between RSV and S. pneumoniae”. 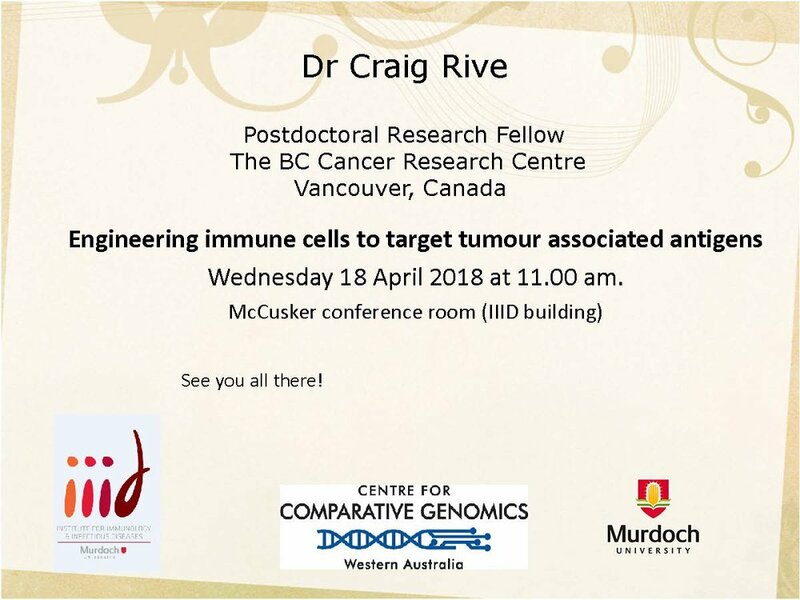 I am delighted to announce the next IIID presentation on Wednesday 7 March at 11am will be by Associate Professor Oliver Rackham, Laboratory Head, Synthetic Biology and Drug Discovery, Harry Perkins Institute of Medical Research and School of Molecular Sciences, University of Western Australia. Associate Professor Rackham’s talk is titled “Re-engineering cellular gene expression”. I am delighted to announce the first of the IIID presentations for the year will be on Wednesday 7 February at 11am by Professor Michael Gait, Medical Research Council, Laboratory of Molecular Biology, Cambridge University, UK. Professor Gait’s talk is titled “Peptide-PMO Conjugates for the Treatment of Neuromuscular Diseases”. I am delighted to announce our next IIID presentation on Wednesday 1st November is by Dr Phil Stumbles, Senior Lecturer in Pathology (Molecular and Biomedical), Murdoch University. Dr Stumbles’ talk is titled “Respiratory Tract Dendritic Cells and the Regulation of Allergic Lung Inflammation”. I am delighted to announce our next IIID presentation will be held on Wednesday 25 October at 11am by Dr Mitali Sarkar-Tyson, Le Souef Research Fellow for Tropical Diseases, Marshall Centre for Infectious Diseases, University of Western Australia. Dr Sarkar-Tyson’s talk is titled “Evaluation of broad spectrum novel inhibitors against Burkholderia pseudomallei Mip protein. I am delighted to announce our next IIID presentation will be held on Wednesday 18 October at 11am by Dr Jenefer Blackwell, Professor, University of Western Australia, Head, Genetics and Health, Telethon Kids Institute. Dr Blackwell’s talk is titled “Understanding infectious disease through genetic studies and HLA”.